It is a truism of armoured warfare that the tank in any form is a blend of three attributes, namely firepower, protection and mobility, and it is the judicious blending of these three factors which creates a successful tank. To this overriding consideration should be added tactical doctrine and the economic/industrial situation of the country wanting to design, build and deploy a new tank. One of the current arbiters of the modern high-intensity battlefield is the main battle tank (MBT), which can be defined as a self-propelled armoured fighting vehicle offering great firepower (normally by means of a gun providing its projectile with a high muzzle velocity for the direct-fire engagement of armoured and other targets), possessing a high degree of protection, and characterised by excellent cross-country mobility. The MBT began to emerge in the early days of the ‘Cold War’ between the US and Soviet blocs in the period immediately following World War II, and reflected the lessons which the various primary powers had derived from their own experiences in World War II and, perhaps just as significantly, their assessment of the design and technical features of the tanks which had been fielded by Germany, their technologically most advanced adversary. So far as it was concerned, the USA was happy with the 70,000-lb (31750-kg) M4 Sherman medium tank and recently adopted 93,500-lb (42410-kg) M26 Pershing heavy tank, the former armed with a 75-mm (2,95-in) gun and the latter with a 90-mm (3.54-in) gun. 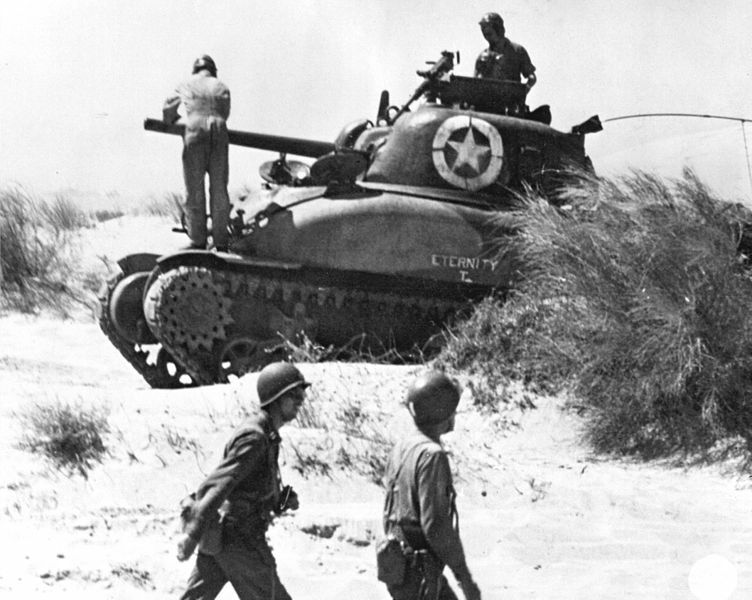 The Sherman had been a war-winning weapon in World War II, but the USA was appreciated that this reflected not so much the Sherman’s combat capabilities, which were useful, but rather the nation’s industrial might that allowed the Sherman to be built rapidly and in very large numbers. The M26 was redesignated as a medium tank after World War II, and paved the way to the M46. The USSR had ended the war with a number of excellent tanks in service, and by comparison with those of other nations these had the advantages of complete standardisation, good firepower and protection, and a combination of excellent mobility, good performance and, perhaps most importantly of all, thoroughly reliable propulsion by a powerful Diesel rather than petrol engine. This last made for greater range of a given quantity of fuel, and significantly reduced the hazards of spilled fuel ignition in the event the tank was hit. The USSR’s two most important tanks in 1945 were the 70,50-lb (31980-kg) T-34/85 medium tank armed with an 85-mm (3.35-in) gun, and the 101,950-lb (46245-kg) IS-2 heavy tank armed with a 122-mm (4.80-in) gun. The best tank to have entered British service in World War I78,800-lb (35745-kg) A34 Comet cruiser tank armed with a 77-mm (3.03-in) gun. The touchstones against which these and other Allied tanks were measured were Germany’s two most capable tanks to have entered large-scaler service. These were the 98,750-lb (44795-kg) PzKpfw V Panther battle tank armed with a 75-mm (2.95-in) gun and featuring armour of good thickness and excellent ballistic shaping, and the 153,000-lb (69400-kg) PzKpfw VI Tiger II heavy tank armed with an 88-mm (3.465-in) gun and also possessing excellent protection. Before and during World War II, the tank suffered in design and operational terms from several limitations as a result primarily of engine power and transmission capability. This made it possible for the designer to create a tank with great agility, thick armour or a large-calibre gun, or perhaps two of these features, but certainly not all three. Current tank tactical theory placed emphasis on the capacity for rapid penetrations into the enemy’s rear areas, in a manner reminiscent of the fashion in which cavalry had been employed, and in combination with engines and transmissions of indifferent power and capability this led to the emergence of two primary types of tank. The first were light tanks, cruiser tanks or even, at the smallest size, tankettes, and these were optimised for speed. The concept for the employment of this light armour was to exploit gaps in the enemy’s line and plunge deep into the enemy’s rear areas in self-supporting armoured groups. This was seen as the best way in which to disrupt enemy’s logistical chain and his command and control capability, and also to delay the forward movement of reserves. The generally held belief was that this type of operation would impede if not destroy the ability of the enemy’s forward troops to continue the battle. 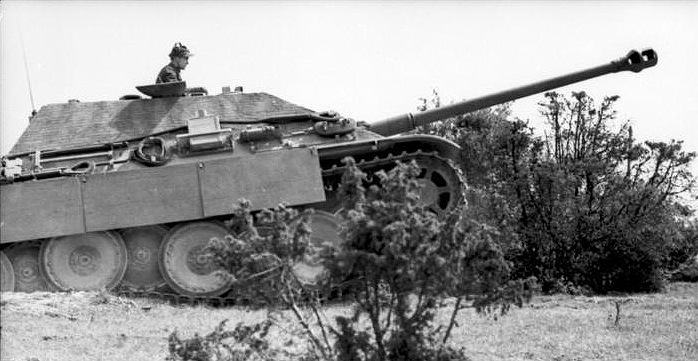 The creation of the gaps needed by the light armour for its exploitation role was the task of the second type of tank, the infantry or heavy tank designed to work in concert with the front-line infantry. Infantry and heavy tanks were seen as needing to move at little more than the pace of the infantry it was supporting, so the available engine power could be used to provide greater firepower and heavier protection. Another feature of the infantry and heavy tank was the use of a longer hull and tracks of greater area so that the vehicle’s lower ground pressure would facilitate movement across shell-shattered ground and overrun field fortifications. Such was the success of the tank is World War II, moreover, that a final class was the specialised tank destroyer. This was generally a development of an existing tank design, but in a form lightened by the omission of much of the armour and on occasion the replacement of the turret by a fixed barbette to enhance speed and agility, and also make it possible to install a gun of considerably greater calibre. The Jagdpanther tank destroyer development of the Panther, for instance, turned the scales at 100,310 lb (45500-kg) as it was still well armoured, but carried a notably high-velocity gun of 88-mm (3.465-in) calibre. The lesson of World War II was that pre-war technical and operational thinking had been wrong, largely because the battlefield, which had been foreseen as a modernised version of that typical of World War I, did not become static, and therefore opened the way for mobile operations, on a large scale as characterised by the campaigns in North Africa and the USSR. This highlighted the deficiencies of the two current types of tank. The infantry and heavy tanks able to slug it out with other tanks were often to be found well to the rear and attempting to reach the front, with the light and cruiser tanks able to maintain the pace of the offensive were more lightly armed and protected, and therefore more readily tackled by the enemy’s heavy tanks and anti-tank artillery. This was a lesson learned early in World War II, and paved the way to tanks with slightly thicker armour, and at the same time larger-calibre guns with which to tackle enemy tanks with the same level of protection. This created the medium tank, which dominated the land battlefield in the second half of World War II. These medium tanks generally massed something in the order of 55,000 to 66,000 lb (24950 to 29950 kg), carried a gun with a calibre of about 75 mm (2.95 in), and were powered by an engine delivering between 400 and 500 hp (300 and 373 kW). Classic examples of this genre were the Soviet T-34/76 with a 76.2-mm (3-in) gun, the German PzKpfw IV with a 75-mm (2.95-in) gun extended in length from 24 calibres in early models to altogether more effective 48 calibres in later models, and the US M4 Sherman with a 75-mm (2.95-in) gun. Another factor which became a primary driver in the development of more capable tanks was the growing availability of higher-powered engines, many of them indirectly if not directly related to the rapid pace of development of high-powered aero engines. A notable example of this trend can be found in the agreement reached in the UK between Rolls-Royce and Rover: Rolls-Royce gained access to Rover’s turbojet technology, while Rover assumed responsibility the development of the Rolls-Royce Merlin aero engine for tank use as the Meteor. 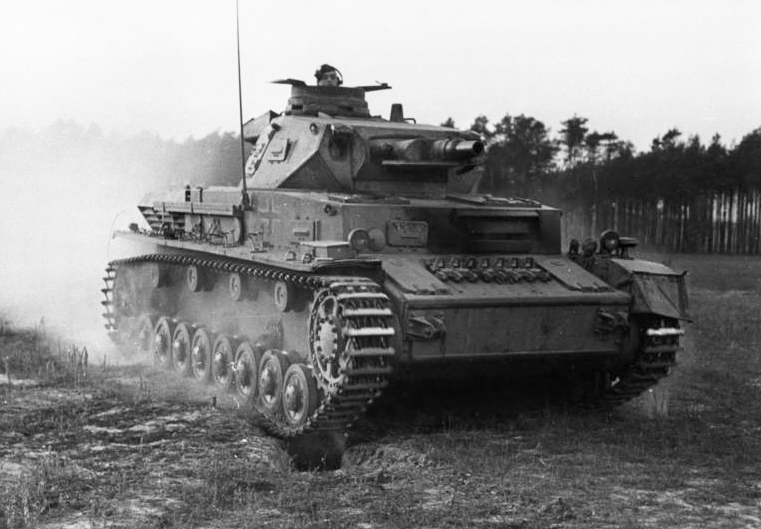 This provided so great an improvement in power that the resulting Cromwell (and related designs) were seen as cruiser tanks: the Cromwell had much the same firepower and protection as the A22 Churchill infantry tank, but twice its speed. Continued development of the basic Cromwell design led eventually to the A41 Centurion, whose development began in World War II but which entered service shortly after the end of the war as what is generally regarded as the world’s first MBT. The Centurion’s armour was able to defeat the efforts of small- and medium-calibre anti-tank guns, its own main gun was capable of defeating even the armour of even the largest of enemy tanks, and it offered a level of agility even better than that of earlier light tank designs. The type’s weakest features were its modest speed (a weight of 114,250 lb/51825 kg and power of 650 hp/485 kW yielded only 21.5 mph/35.5 km/h) and poor range of only 118 miles (190 km), later extended by the addition of a towed trailer with additional fuel.